tG: I need light, so I can be enlightened. 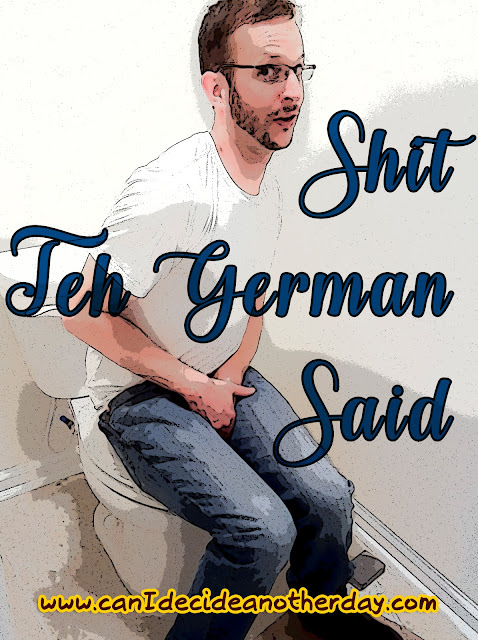 Teh German walks in the bathroom and sniffs and turns on the fan in the toilet closet after I had just emerged. tM: Everything that comes from me smells like roses. tG: Well, you're not getting anymore roses. tM: Did you just fart while you blew your nose? tG: Yeah, too much air and I had to use my after burner. tG: They are in the business of money and making money and they don't want to lose money. tM: Don't make me smile when I'm trying to be angry. tG: I'm trying to logic you. Hockey Announcer: Penalty on Player 44 for tripping. tG: That ref is tripping. Mom-E: 2 million dollar sign on bonus. Politics pays. tG: 2 million!? I don't care who pays. tG: Alexa, play a party song. Alexa: playing Spotify Latin Dance Party playlist. tG: Alexa, stop. Don't ever do that again. LOL sometimes I want an Alexa or whatever just so I can have those conversations.